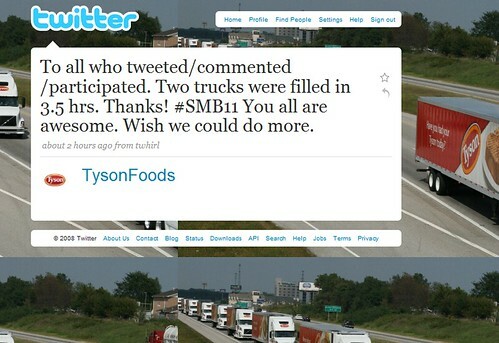 Social Media Breakfast Leverages Two Truckloads of Tyson Food Donation for Boston Food Bank! 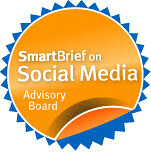 The theme for Social Media Breakfast #11 in Boston this morning was "Social Media for Social Good." To kick off the event, Bob Collins and I organized a call to action for the group. Tyson Foods was willing to donate 100 pounds of protein to the Boston Food Bank per comment on its Hunger Relief blog. We announced that at the beginning and asked people to get on Twitter and tell their followers. Within 90 minutes, we had 300 plus comments - enough for one truckload. We had the second truckload within 2.5 hours and had as of this writing over 800 comments. Thanks to all who helped make this a success and to Tyson Foods for their generosity. Got an interesting question about organizational networks and will write up a separate post on that because it is something I've been thinking about. I gave a presentation called "Be A Geek Who Gives." I was going to a presentation that I had done before, but got inspired after listening to Lucy Bernholz on marketplace and seeing the launch of TheGiveList. Outstanding results, and I'll use this as an example of the power of Twitter in a presentation I'm doing in January for the Spokane MarComm Association on social media. I would love to hear from someone at Tyson Foods about how this fits into their overall communications and cause-related marketing mix. Driving people to the blog reinforces a connection between Tyson and hunger relief. Is that the only goal, or do they hope to sell more chicken, too? Thanks for sharing and kudos on a great project! It was a pleasure presenting with you and I hope we have a chance to do it again.